Hello welcome to Masked_Man's guide to Tidehunter. Tidehunter is a very tanky offlane utility core hero famous for his game breaking ultimate and epic team fights and man fights. A decent anti-carry and an arsenal full of stuns, slows, armor and damage reductions and purges. You can also check out my other guides Here. Ladies and gentlemen behold the Tidehunter. With Aghanim's Scepter, Gush becomes a ground targeted wave ability that travels for 1800 range. Can be used to pop Linken's Sphere. Gush is a Magical damage nuke, slow and armor reduction that lasts for 4 seconds. It's a useful spell for focusing heores in team fights and to catch fleeing enemies. Keep it in mind that armor reduction means more Physical damage will be dealt by Anchor Smash. Does not prevent Magical damage. The damage reduction is always on and is not connected to the damage threshold for buff removal. The damage reduction is Damage Block (like Stout Shield) and the debuff removal is a strong dispel. Only damage from player owned sources is counted towards buff removal. Damage counter for buff removal resets when Tidehunter doesn't take player based damage for 6 seconds. Buff removal occurs every 600 / 550 / 500 / 450 damage taken(after reductions). Kraken Shell won't remove certain debuffs, such as Bloodrage, Fury Swipes, Doom, Maledict. Kraken Shell is the skill that makes Tidehunter who he is. Damage block makes your laning very strong a allows you to completely forget about Physical damage harassment but unfortunately it doesn't block Magical damage so heroes with Magical damage harass like Huskar, Jakiro, Io, Pugna or Pure damage harass like Chen, Bane can really make your laning difficult. Kraken Shell's purge is one of the strongest purges in the whole game, It removes stuns, slows, damage and armor reductions, EVERY DEBUFF in the game except for the not dispellable spells like Burning Spear. If a Rubick steals your Ravage and cast it, You will only receive damage, not the stun. Tidehunter swings his mighty anchor to damage nearby enemies and reduce their base attack damage. Anchor Smash is a very useful skill. It's a Physical damage AoE nuke and damage reduction that allows you to farm lane and jungle camps and ancients easily and harass the enemy melee heroes who dare to last hit, The more damage you have the more damage you deal with Anchor Smash. In manfights against right-click heroes and in team fights, Anchor Smash gives you a lot of advantage by weakening your enemies damage out put and allows you and your team to destroy your enemies without having much trouble from their scary right-click heroes like Chaos Knight, Phantom Assassin, Templar Assassin, Legion Commander, etc. Units hit will fly for 0.52 seconds before the real stun is applied. Full damage and stun are dealt to invisible units. Ravage waves move outwards at a speed of 725. Level 2 Ravage + Refresher Orb + Level 2 Ravage costs 825 mana , This means you will have enough mana to cast your spells as long as you want. Ravage is better to be used in team fights mostly but don't hesitate to cast it to secure a kill or two. In late game good supports or carries with Force Staff or Eul's Scepter of Divinity can ignore Ravage. That's why quick blink initiation and good positioning is necessary. Ravage scales very well with AoE ultimates that need time to be effective like Macropyre, Freezing Field, weave, Supernova, Chain Frost, Epicenter and Chain Frost. We choose extra Gush Magical damage for more nuking power. the reason we don't pick extra movement speed often is that huge part of our mobility comes from Blink Dagger. In case you want to build Drum of Endurance, picking this talent is viable. Choose wisely. Pick 40% XP gain if: 1) You believe game is going to last more than 35 minutes. 2) The enemy team's main damage source is not Physical. 3) There is not a right-click hero with massive range that your Anchor Smash can't hit in the enemy team like Sniper, Drow Ranger (The most important reason). +25% Anchor Smash Damage Reduction is very strong against right click carries and hard carries like Phantom Assassin cause it can neutralize their impact in team fights. ONLY, ONLY, I mean it ONLY go for -5 gush armor reduction if you have built Aghanim's Scepter. AoE -12 armor reduction is your team's right-click heroes dream specially cleave heroes like sevn. +30 Kraken Shell Damage Block makes you a lot more tanky and when combined with +25% Anchor Smash Damage Reduction, It makes you unkillable for right click heroes. 25% cooldown reduction is very very useful. The cooldown reduction that stack with Octarine Core, decreases the cooldown of all of your items and skills. Which means more anchore smashes and more Gushes in team fights, More Arcane Boots, Mekansm or Guardian Greaves heals and mana and a lot more Ravage, refresher combos. Tidehunter is not a carry nor a right click hero and picking +250 damage is not viable at all compared to 25% Cooldown Reduction. Forget RNGesus crit builds (Please). Enchanted Mango is a very good early game item. It provides health regen which is useful in suicide lane and It gives you emergency mana when eaten, pretty useful when you are out of and you just need to cast a Ravage or Gush to secure a kill. NOTE: health regen of Enchanted Mango is the cheapest early game counter of Heartstopper Aura in laning phase. As an off-laner, your job is to stay in lane as much as you can and ruin the enemy carry's farm. Tango and Healing Salve do this for you and keep you away from those lovely shrines. A very cost efficient early game item, necessary for almost all heroes. It gives you stats and charges, every time your enemies cast a spell. Charges give you enough mana to cast your spells and enough health to stay in lane or survive a teamfight. Your only boots choice are Arcane Boots. Arcane Boots provide mana, movement speed and ability to restore Mana that solves all of your (And most of your team's) mana issues which is the main reason why it is a solid build on Tidehunter. Arcane Boots are better to be the first core item that you build because it allows you to spam Anchor Smash to farm faster. Mekansm gives you stats and Armor and by spending 225 mana, All allied units in 900 radius is healed 250 HP and gains +2 armor. Guardian Greaves provide stats, Mana, Armor, Movement speed and Restores 250 health and 160 mana to nearby allies, and removes most negative buffs from the caster. But you won't spend any mana, that is why upgrading Mekansm into Guardian Greaves is necessary when you want to build Refresher Orb on Tidehunter. 225 mana is not something you can afford in a Refresher Orb, Ravage combo. mechanism and Guardian Greaves delay your key items like Refresher Orb or shiva's gaurd but if no one in your team have built it, you better build it your self. Burst heal changes team fights and turns the tables and Tidehunter is all about team fights. Having trouble with Magical damage? There is a scary looking sandking or Jakiro in the enemy team who hurts your team a lot? Then build a Pipe of Insight. Pipe of Insight provides HP Regen and magic resistance and magic resistance and HP regen aura and 400 magic damage block for allies. Extra magic resistance and Magical damage block aids your team against teams with massive Magical damage out put and turns Tidehunter into a Magical damage tank as well. Drum gives stats, mana regen and provides a lot of mobility for your team when activated. Its active can be used to catch fleeing enemies or to escape them. A very inexpensive utility item. Veil of Discord provides stats, HP Regeneration, Damage, Armor and ability to decreases the magic resistance of your enemies when activated. Veil of Discord is better to be built when your team has lots of Magical damage dealers and no one is going to build it. On the paper, Blade Mail is a go to item but in reality, it ain't your job is to soak as much Physical (And magical if you have built a Pipe of Insight) damage in team fights and only noobs attack a hero with active Blade Mail in the middle of a teamfight. When to build Blade Mail? against squishy heroes with decent damage out put like Drow Ranger, Sniper, Lina or heroes who are fragile against Blade Mail like Huskar. Heaven's Halberd Is very useful against right-click heroes who rely on mass attack speed and lifesteal like Phantom Assassin, Ursa and Huskar. These heroes will be very vulnerable when they are not attacking and stealing life. Heaven's Halberd gives you nice strength, status resistance and evasion that just makes your right-click enemies cry. Solar Crest provides armor, stats, mana regen and movement speed and can provide lots of utility for your teammates. Save focused allies or turn them into deathball or focus enemies with it. Aghanim's Scepter turns your single target Gush into an AoE ground target skill that moves 1800 units and slows and damages and reduce the armor of the units it hits. Very very useful if you right-click heroes with cleave like Sven and Tiny or Battle Fury or heroes like jaugernaut or Ember Spirit who hit all enemy units. Agh's Gush is at its strongest when the -5 Gush armor reduction is picked. There is an annoying Riki or Bounty Hunter in enemy team? Their Legion Commander is building a Shadow Blade? Then buy a Gem of True Sight and since you are a tanky hero, you are a perfect carrier of it. Play safe and let your team benefit from true sight as much as possible and try not to die, not until their invisible hero or Shadow Blade carrier is dead. Don't panic if you've lost your gem, you can easily take it back, just plan a gank and do it with one or two partners cause you can never know where their invincible hero is when you are not carrying Gem of True Sight. My favorite item on Tidehunter. Double the ultimate, Double the terror. Refresher Orb provides 3 mana regen and +11 health regen and refreshes all of your spells and items. More than 5 seconds team disable is just game breaking ans allows your team to finish the team fight before your enemies eveny start it. NOTES: Refresher Orb refreshes Arcane Boots and Guardian Greaves. Use this advantage to save more mana for your spells and items. Shiva's Guard gives you +15 armor and +30 intelligence, good mana pool and mana regen. The Arctic Blast's AoE movement speed slow + Freezing aura's attack speed slow + Anchor Smash's damage reduction turns Tidehunter into a true anti-carry and makes your enemy right-click heroes fade. You can use Shiva's before blinking in for an instant AOE nuke. Scythe of Vyse is one of the best late game items it provides +10 Strength, +10 Agility, +35 Intelligence, Mana Regeneration and Hex. Hex turns an enemy hero into an animal and makes it unable to attack or cast spells or run away and removes all of its buffs like evasion. In late game and ultra late game, a Tidehunter with a Refresher Orb and schythe of vyse is the king of disables. one of the items that I really love to build on Tidehunter. Octarine Core provides intelligence, HP, mana and +25% cooldown reduction that stacks with 20% cool down reduction from level 25 talent and 25% spell lifesteal on heroes and 5% on creeps. each level 3 Ravage tentacle deal 450 Magical damage and If Ravage hits at least 10 units, total damage out put will be 4500 (without calculating magic resistance and spell amplification), 25% spell lifesteal on heroes and 5% on creeps allows you to have burst healing each time you cast Ravage, The more targets it hits, The more life you will steal. Can provide lot of utility for team. Can't participate well in teamfights without Ravage. As an off-laner, your job is to stay in lane and ruin the enemy carry and farm utility items. You can Solo off-lane or do it with a partner if against tri-lane. Try to play safe and sustain your health but don't h***itate to go aggresive when the momentom comes.You can make farming for your enemy carry harder in different ways, Harassing with Anchor Smash is one of these ways. If there is a melee carry in front of you, Harass him with Anchor Smash every time he wants to last hit, This way, You deal a decent amount of damage and reduce his damage which prevents him to last hit and farm efficiently. Another way is Blocking. Try to block the way of your creep wave and keep the fight near your tower which allows you to have safe farm and no farm for your enemies. You are not a support but sometimes a deep ward helps you to keep the track of your enemies and see their actions. If their support is stacking camps, Go ahead and enjoy your free stacked camp when you have level 3 Anchor Smash and level 2 Kraken Shell then place a ward in the camp to prevent it from summoning creeps. Use the shrines when every the situation is bad, If you are being chased, Go near the shrine, Activate it and come back to fight with full health. Always carry a TP and keep an eye on the mini map. As Tidehunter your job is not to just win an epic massive team fight, It is mostly about winning those small team fights which no one remembers after the match. Your team mates in safe lane are in trouble and your enemies are following them and may perform a tower dive to kill them? TP there and save them by body blocking the enemies and reducing their damage or kill them with your team mates then come back to off-lane. Mid laner is being ganked? TP there with another team mate and turn the tables. As soon as you reach level 6, Tell your team mates and plan a gank to get early game advantage and if lucky, A free tower. When your team wants an early Roshan, Your job is to be the meat shield. Kraken Shell blocks a decent amount of damage and purges Roshan's stun most of the time and you can cast Gush on him to pop him spell immunity. Now it's time. Now you must have Magic Wand for health and mana sustainment, Arcane Boots for mana and your lovely Blink Dagger for initiation and escape. Your job is still to stay in off-lane and make big troubles for the enemy carry ahead of you and join the fights when the moment is right but now, You can manfight almost all of the right-click heroes in the match. Reduce its armor with Gush and deal tons of Physical damage with extra damage from level 10 talent and Anchor Smash but NEVER use Ravage just to get one kill in mid-game. Never risk it and cast Anchor Smash and Gush before the Ravage. Your enemies will stun or silence you and they kill you before you even blink. Best team fight scenarios are 5 man tower defend or base defend since you have tower damage and armor by your side and you can Gush the enemy hero who is being hit by tower to get extra damage and you can use shrines whenever your health is low. Worst team fight scenarios are 5 man tower push or base push. Extra armor for your enemies means less efficient Anchor Smash and auto attacks and tower damage and shrines means less advantage for your team. In these situations, Focusing is the trick. Focus their most efficient hero (#1 in late games, #2 and #3 in mid game) with Gush and kill him or make him escape, Then, Go for Ravage combo. Running Won't Help! Ladies and Gentlemen behold the final stages of the game where each victory in team fights decide the fate of the match. Now you must have your core and at least two utility items if you have had a good mid game or just one if you have had a bad one but now your focus must be on two key items: Refresher Orb and Shiva's Guard. These items have very high impact on the team fights and make you come out victorious. In late game team fights, Your top priority is to kill their #1 and #2 or to save your even if you have to sacrifice your self to protect them. Refresher Orb and Shiva's Guard Or Scythe of Vyse Or Force Staff combo: Blink Dagger > Ravage > Guardian Greaves > Shiva's Guard Or Scythe of Vyse Or Force Staff > Gush > Anchor Smash > Refresher Orb > Guardian Greaves > Shiva's Guard Or Scythe of Vyse Or Force Staff > Gush > Anchor Smash > Auto Attacks. As you can see, These are long combos which need to be performed quickly to be effective and with some practice, you will master it. You managed to master the refresher combo? Good Now multiple the fun and stun with refresher shard. The best friend of every hero in the game who needs mana early. Crystal Maiden gives you every thing that you need during the game, Mana regen, Crystal Nova's good attack and movement speed slow, Frostbite's DoT root that allows you to hit melee heroes with Anchor Smash with out being hit and best of all is her ultimate, the Freezing Field. If have ever played CM, You will notice that landing a full challened Freezing Field is like an unreachable dream but Ravage's AoE disable allows her to cast a fully channeled Freezing Field that really really hurts your enemies. You can dominant the early and mid game team fights with CM. Dazzle your very good friend. He heals you and damages enemies around you with Shadow Wave, Slows enemies with Poison Touch, Keeps you alive in the middle of the fight and can reduce your enemies armor with weave while they are stuned and allows you to deal full damage with Anchor Smash even in the late game. Lich gives you a lot of armor and attack speed slow with frost armor and can deal Magical and slow movement and attack speed of several units with Frost Blast but what I really like about Lich is Aghanim's Scepter upgrade for Chain Frost thar allows it to have unlimited bounces. This means sick amount of Magical damage out put until the end of the team fight. If you have a Sven in your team, I suggest you to build Aghanim's Scepter. Sven can deal decent amount of damage and cleave damage and provides armor and extra movement speed with Warcry and has an AoE stun that can be used for extra disable after Ravage or to be used for BKB trap. Leshrac can deal decent amount of Magical with and Physical with damage in short radius and there is always high risk of death, Tidehunter solves this problem by providing utilities, Natural tankiness and Ravage. These features allow Leshrac to show his full potential and give a edge to your team in pushing team fights. Nothing hurts Tidehunter more than Magical and Pure damage. That's why Silencer is such a good friend for Tidehunter. Last Word and Global Silence give you all of that. Omniknight heals you and deal Pure to the enemies around you, slows the fleeing enemies, Gives you extra regen and tons of status resistance and gives your whole team full protection against auto attacks. Brewmaster and Tidehunter can be really annoying for your enemies. Together they can reduce enemies damage, armor, movement speed, attack speed and accuracy which makes the teamfights much easier. Cyclone removes an enemy hero from the battle field and Hurl Boulder stuns the target and makes it easy to steal and deal damage. Heroes who can misused long teamfights with AoE disables are your worst enemies. 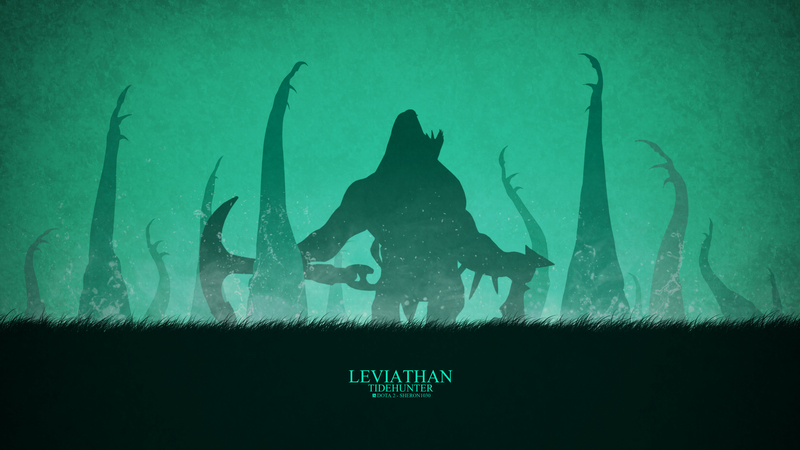 He has the most advantage against Tidehunter among his enemies and about 10% more than the others. Chen has a Pure damage nuke and Penitence is probably one of the best focusing skills in the whole game but what makes him a real threat are Holy Persuasion and Hand of God. Holy Persuasion allows Chen to control several units and jungle creeps and all these creeps has their own special abilities, Some of them can purge Anchor Smash, Some of them have disables and nukes and many of them have special auras and they all provide vision. This means no quick surprise blink in initiations for you. Hand of God is just your teams worst nightmare, It heals all of the enemy heroes. When your team is desparetly trying to win team fights, Chen ruins your affords by his Hand of God. Items: Counter heal is the key for countering Chen so building Mekansm and Guardian Greaves is neccesary. If you want to win team fights against teams with Chen, You need to get rid of him first. In that case a Force Staff is pretty handy. Cast it on Chen and send him in the middle of your team, stun or silence him then kill him. I'm not much of glimmers cape on Tidehunter fan and prefer smoke ganks instead but if you think you have difficulties for quick blink in initiations, build a glimmers cape. Tactics: Good Chen players always keep one or two creeps beside the lane in which prevents surprise ganks but none of these creeps have true sight. This is the moment smoke ganks become important. Cast Smoke of Deceit on your team and approach them and when the moment is right, Initiate and focus Chen. Well of course the best anti tank n the game is pure nightmare for a supertank like Tidehunter. Two things make him very dangerous for you. First is Heartstopper Aura, Which abuses your high HP and makes your laning hard if he goes in safe lane. The other skill that truly hurts you is Reaper's Scythe that kills you easily. Items: Pipe of Insight is the item that you must build after the core item. Extra magic resistance is the key for countering Necrophos and Pipe of Insight provides descent magic resistance and spell damage block for you and your allies. Wise support who build Glimmer Cape are very effective against Necrophos cause they can cast glimmer on the locked target and save it. Alchemist is a real survivor. Chemical Rage gives him enough health regen to last till the end of the team fight and Acid Spray abuses long team fights. Items: First of all, Acid Spray. Build Mekansm in order to counter it. Alchemist needs to be put down quickly or he will snowball out of control. Solar Crest, Scythe of Vyse and Heaven's Halberd come in handy. Well there wasn't much of a surprise here. Tidehunter and Kunkka always had history. Tidebringer is not blocked by Kraken Shell and in teamfights, Kunkka can really hurt you and your team with Torrent and Ghostship. Items: Provide tons of utility for your team, Mekansm must be the first after core item cause of burst heal and armor. Then, Shiva's Guard since Kunkka's attack speed in not that mush and Freezing Aura makes Kunkka less efficient. Tactics: Be very quick, If Kunkka casts Torrent on you before you cast Ravage, you will loss some valuable time. so be quick and blink next to him. Nothing makes Leshrac happier than initiators who come into the mouth of the lion by their own will. Same like Kunkka, Leshrac can stun you where you have blinked in. He also has two Magical and Physical damage nukes which damage multiple targets but they can focus single targets and guess who is that target when he blinks in? Leshrac also misuses the long team fights, The longer it be, The more damage he can deal. Items: Pipe of Insight must be your after core item. More magic resistance and magic damage block for you and your team means much less dangerous Leshrac. What should you do against Diabolic Edict? Armor from Mekansm and level 15 talent are very useful. Late game a Shiva's Guard or Solar Crest will aid you much more. Another late game item against Leshrac is Scythe of Vyse. Sheep stick gives you and your team just enough time to erase Leshrac from the team fight. Tactics: Leshrac is pusher so most of the teamfights of the match are going to be near your towers, This is an advantage already. So you can use Force Staff, Gush and Solar Crest for focusing him. An aggressive support like Lion and Bane can be very useful here. Pure damage nuke, A strong anti-carry, Channeled Magical damage nuke? Sounds like a Nightmare. Bane can really hurt you. Although Kraken Shell purges Fiend's Grip in the middle of the channeling, Brain Sap and Nightmare turn Bane into a real nightmare for you. A smart Bane with Eul's Scepter of Divinity can cast Nightmare on you and keep you inactive until the end of the team fight and without you, Your team will be eaten alive since you couldn't reduce your enemies damage. tactics: Unfortunately you can only rely on your team when against Bane. Heroes with strong dispells like Legion Commander or an Omniknight who gives you a free BKB with repel are needed in your team if you want to put an end to Bane's Nightmare. Just go for a Refresher Orb combo when a Nether Ward is planted and watch your health disapear. Pugna can deal decent amount of Magical to you with Nether Blast and can drain your health and mana with Life Drain. Items: Try to minimum your mana usage. Upgrade your Mekansm into guardian greeves and If you are going for Refresher Orb, you better forget about building Scythe of Vyse and Shiva's Guard unless you have already built a Pipe of Insight. Tank up! Build Octarine Core gain some nice HP that tanks Nether Ward's and Nether Blast's damage. Force Staff is also a great way to break Life Drain's link. Tactics: You cannot destroy Nether Ward before you perform your combos so in this case, You need your allies. The ward is better to be destroyed in the first second of Ravage's stun before you cast Anchor Smash and Gush to save some health. Luna destroyes you the same way Leshrac does. Being hit by 8 Lucent Beams is not really beautiful not to mention dezens of moon glaives flying between your allies. Items: Pipe of Insight ASAP! with some extra magic resistance and magic damage block, Luna's ultimate will be useless. Heaven's Halberd is the next item you should build. Few seconds of disarm is all you need to take the advantage of the team fight in the hit of the moment. Huskar doesn't care about Anchor Smash's damage reduction since most of his damage is Magical, He lasts long in fights because of inner vitality, Usually builds a ton of armor so Gush won't hurt him much and worst of all, He is an Anti Tank. He is not a good team fighter but he can kick you in your grave at least. Items: Solar Crest and Pipe of Insight must be your first after core items, farm them as soon as you can before he builds his first after core items with is normally armor. Use Solar Crest for focusing him and Pipe of Insight for protecting your self and your allies against his magic damage. Heaven's Halberd also disarms him a makes him unable to steal life. Well this guide is finished too. be sure to check out my other guides Here. Master Tidehunter, keep your KDA and Assists sky high and have fun.